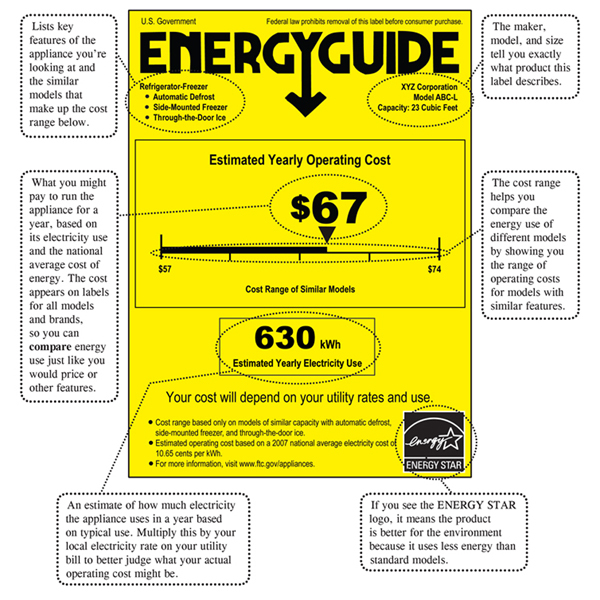 Water heaters come with labels and information for consumers to use when purchasing a new one. 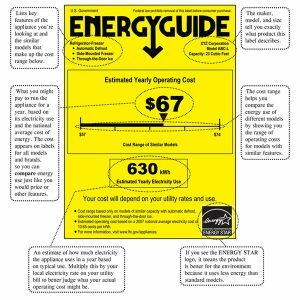 These labels provide facts on how energy efficient the unit is with an energy factor label and Energy Guide. Be sure to understand which type and size of water heater that is required and will be most beneficial in your home and use the labels on the water heaters to compare the purchase price and cost to use each unit. If you have questions or live within the Northern Colorado area and need to schedule a repair or installation, Call ACE HI PLUMBING, HEATING & AIR today at 970-667-0300. We provide 24/7 emergency services in Loveland, Fort Collins, Berthoud, Longmont, Johnstown, Milliken, Greeley and Estes park. Efficiency indicates how well an energy conversion or transfer process is accomplished. This means that 30% of the energy is lost to the environment. An electric resistance heater has a thermal efficiency close to 100%. when Comparing heating units, such as a high efficiency electric resistance heater to a natural gas-fueled furnace with an 80% efficiency, an economic analysis is needed to determine the most cost-effective choice. The thermal efficiency is sometimes called the energy efficiency, which is the goal to reduce the amount of energy required to provide services and products. In the U.S., in everyday usage, the SEER is the more common measure of energy efficiency for cooling devices, as well as for heat pumps when in their heating mode. For energy-conversion heating devices, their peak steady-state thermal efficiency is often stated, for example, “the efficiency rating for this furnace is 90%”. There is a more detailed measure of seasonal energy effectiveness called the Annual Fuel Utilization Efficiency, or AFUE. For example, a 90% AFUE rating for a gas furnace means it outputs 90 BTUs of useful heating for every 100 BTUs of natural gas input. A higher AFUE means higher efficiency. Energy efficiency of a water heater is measured by its energy factor. The higher the energy factor number, the higher the energy efficiency of the water heater. Electric water heaters have an average energy factor between .75 and .95, while gas water heaters range between .50 and .70. Does this mean that electric water heaters are more energy efficient? Electric models make better use of energy, while gas water heaters lose some of their energy up the vent. Although electric models may be more energy efficient, electric energy usually costs three times more than gas, so if you have a choice, it is still cheaper to use natural gas. Electricity is created and delivered, which uses energy. One must take into account the entire picture and when doing so, you will find that in most places, gas is more efficient since it usually uses less energy to mine and deliver natural gas than to acquire some other energy source, convert it into electricity and deliver it. You should also take into consideration the energy used building and maintaining the infrastructure to produce and deliver the energy. If you are going to buy an electric water heater, it’s recommended that you look for one with an Energy Factor equal to .93 or greater. This represents a 5 to 10 percent savings compared to a standard efficiency electric water heater. This higher efficiency is achieved by better tank insulation to reduce standby losses, and a device to block cooler water from adjacent water pipes from sinking into the tank where it needs to be reheated. The savings pay for the slightly higher costs of these heaters within a year or two. A standard efficiency 40 gallon natural gas water heater typically has an Energy factor of about .55 due to inefficiencies of combustion, a central flue carrying heat away with combustion exhaust, and a continuous gas pilot light, as well as standby losses through insulation and thermo-siphoning. A gas water heater with an Energy factor of .62 or greater represents a 10% savings compared to a standard efficiency gas water heater. In addition to reducing standby losses with added insulation and anti-thermo–siphon device, or heat traps, these improved efficiencies can be achieved for very little added cost by using electronic ignition instead of a pilot light, having automatic draft dampers, and reducing losses out of the flue by recovering more of the heat first. Never attempt to repair or replace the unit unless you know exactly what you are doing. Remember, you are dealing with dangers including scalding hot water, natural gas flames, heavy lifting and risk of electrocution. If you have any questions concerning your water heater, call ACE HI PLUMBING, HEATING & AIR today at 970-667-0300. We have experienced technicians and offer top quality service at an affordable price.